We all know the story about the goose that laid golden eggs. Last week in my garden I found golden eggs that were definitely not laid by a goose. It happened while I was hand weeding. 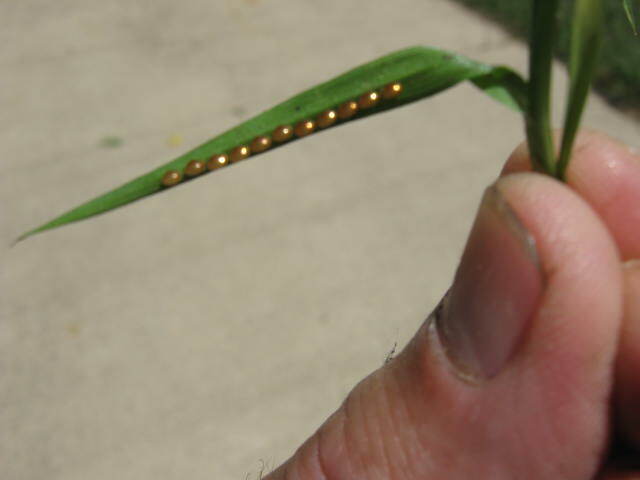 I came across a blade of grass with tiny, metallic-gold eggs all in a row. They are quite striking when you first see them. The eggs really do look like they’re made of gold but of course they are not. It’s just the way the light reflects off of them that gives the gold appearance. Even though the eggs are small, their golden color makes them easy to spot. I kept the leaf in a jar and watched the eggs. 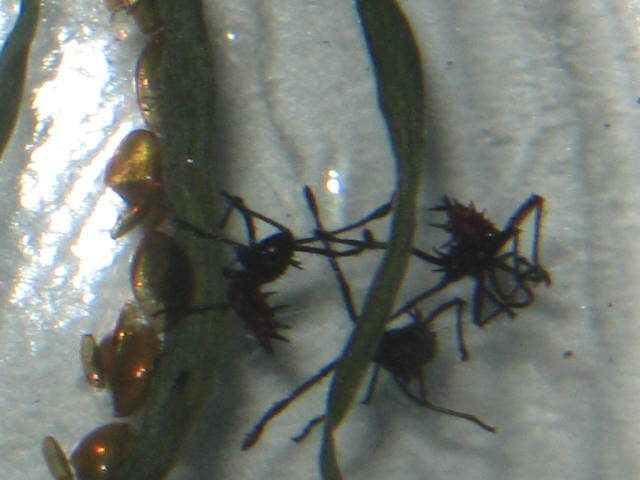 What hatched were evil-looking spiny, red-colored nymphs — probably one of the Euthochtha species of stink bugs. Most likely one of the plant eaters. This is the nymph stage in the lifecycle of a stick bug. It’s not uncommon to find these eggs but it does provide a bit of a diversion from the otherwise tedious job of weeding by hand. A few days ago, I had a chance to see the blooming agave plant at University of Michigan’s Matthaei Botanical Gardens Desert House — the one you’ve been hearing everyone talking about. 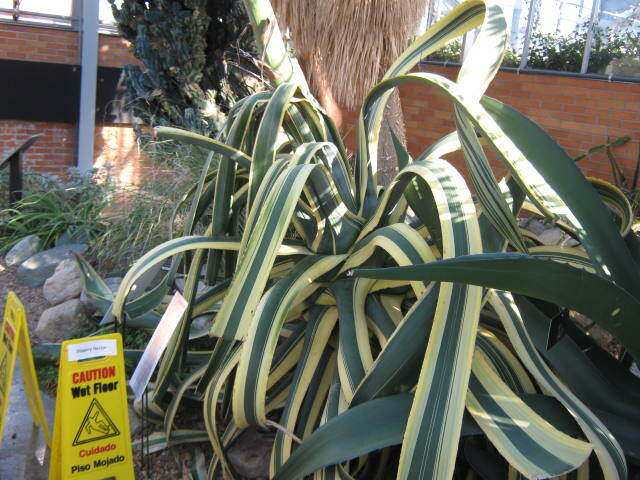 When I first saw this plant over 30 years ago, it was already 50 years old. Through the years it didn’t appear to change much but of course it has been growing and maturing all that time. Now after 80 years, it is finally blossoming. 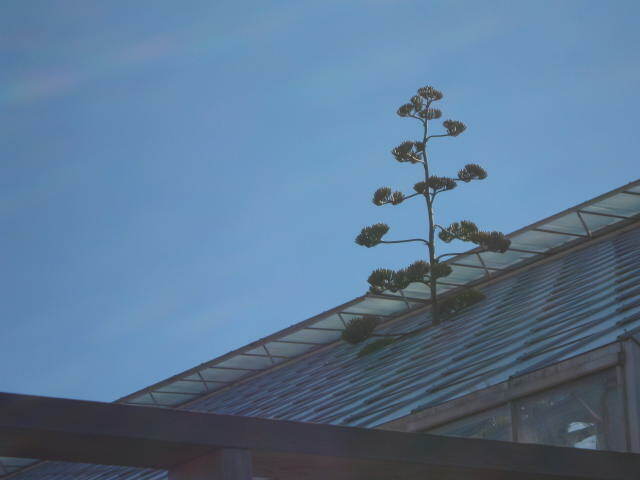 It has produced a flower stalk so tall that they’ve had to take out some roof glass from the greenhouse in order to give it more room to grow. 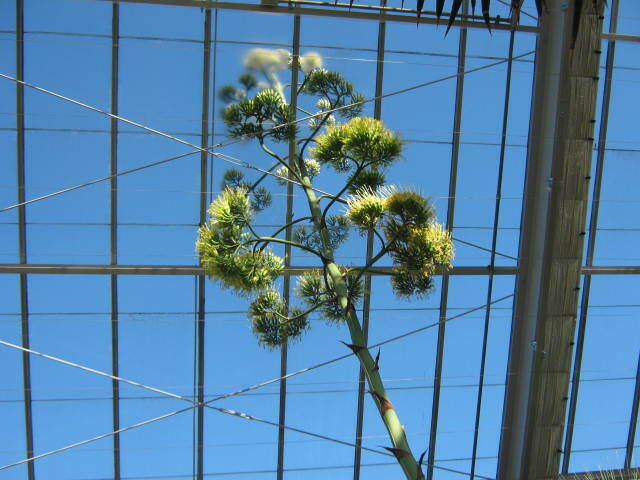 The agave flower stalk has grown through the roof. I encourage you to get out to the Botanical Gardens and see it. This type of agave blooms only once in its lifetime so, when it’s over, it’s over. 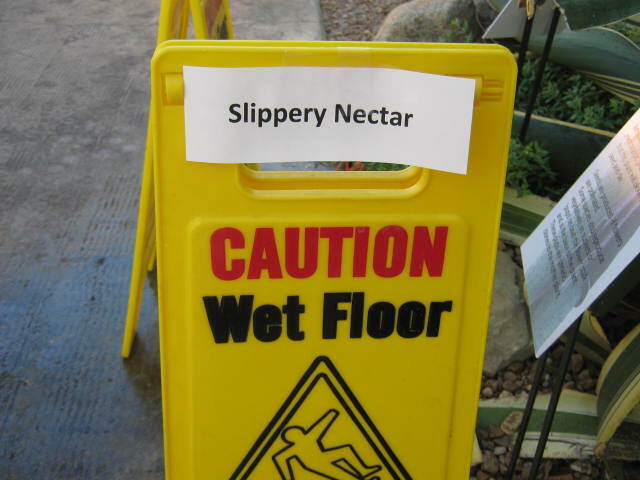 The agave flowers are producing real agave nectar, not the manufactured stuff you buy in the store. Matthaei Botanical Gardens is located on Dixboro Road south of Plymouth Road, Ann Arbor, directions and hours are available on their website. I just got back from a relaxing week-long vacation at Bear Lake in northern Michigan. The first thing I did, even before unloading the car, was to take a look at the garden. It’s amazing how much a garden changes in a week at this time of year. Everything looked great except for my sweet corn; it’s looking a bit peaked. The lower leaves are turning yellow, which is a sure sign of nitrogen deficiency. If plants can’t get enough nitrogen from the soil, they will rob it from older leaves and use it to grow new leaves — that’s what causes the discoloration. Plant use nitrogen to make chlorophyll, the green part of a leaf that is responsible for photosynthesis . I can trace the problem back to last season. In that spot last year, I mulched the growing vegetables with a generous covering of wheat straw. This spring, instead of raking out the old mulch, I left it in place and tilled it under. Since then, soil microorganisms have been working overtime trying to decompose all of that straw. They require loads of nitrogen to do the work of decomposition. 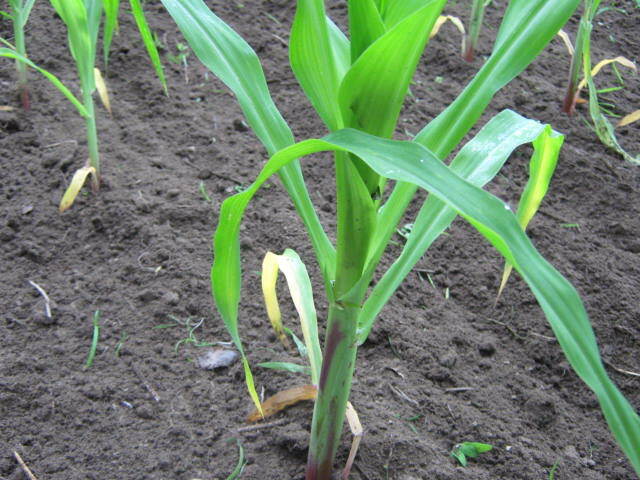 As a result, there is not much nitrogen left over for the sweet corn to use. Now I’ll have to add nitrogen fertilizer to make up the difference. I have some urea fertilizer left in a fifty-pound bag that I have been dipping into for several years now, it’s finally almost empty. Urea is an artificial fertilizer that contains forty six percent nitrogen and nothing else. That makes it a “hot” fertilizer, meaning it is very easy to burn growing plants with it if you’re not careful. I like to mix it with sand to help make it easier to spread evenly. Other types of fertilizers, such as fish emulsion and blood meal, contain nitrogen in a different form and will provide nitrogen without the danger of plant damage. Because those types of fertilizers contain less nitrogen on a pound for pound basis as urea, you’ll have to apply more to get the same results. Nitrogen deficiency results in weaker plants and lower yields so it’s a good idea to correct the problem early, while the plants still have time to recover.